Answers to some of the most common questions we see about TMJ/TMD and our services. How much is TMJ treatment? It is important to remember that all patients are unique and as such, treatment costs may vary greatly. The cost for the initial consultation is $340 and claimable on Private Health Insurance “extras” using 2 x Dental (015, 963) item numbers and 1 x Chiropractic item number (IC-1 – or your health fund number used for this service). Payment plans are offered once a deposit is paid through DentiCare Finance – available at 0% interest, and payments can be arranged over 6-12 month periods to help patients with budgeting. If neuromuscular orthotics are required, our programs may cost between $2150 – $6810 depending on what is assessed at the initial appointment. These costs include review fees in each program. Our most extensive program is a four month program for those that need to stabilise their jaws – perhaps due to dislocation, or to aid in healing chronic inflammation in the jaw joints and/or to address cranial/structural involvement. This program requires compliancy of fortnightly appointments where we closely monitor progress. We make necessary corrections during review appointments, focusing on cranial/structural issues whilst also monitoring whether the orthotics need adjustment with the changes that occur along the way. Two types of orthotics are needed for this program, a neuromuscular day appliance and also one for night wear. Eventually you are weaned from the day appliance and continue to wear a night appliance to stop future injury. Of course not everyone falls into the four month treatment category as mentioned above. It may be that you need another course of action which could range between $2150 – $2625. These costs also include two follow up reviews. Item numbers are available at the initial consultation for the various treatment options recommended, so that rebates can be sourced through patients Private Health Insurance. Do you offer a finance plan for treatment? Denticare offer patients a finance plan at 0% interest on the remaining balance of the treatment, after a deposit has been paid to us. How does a neuromuscular orthotic device alleviate TMJ? An orthotic device or bite plate only works if it has been made to the exact position for each individual. The combined over 50 years of experience in treating TMJ of Dr Shah and Dr Dowker has allowed them to develop techniques that makes sure your orthotic allows your jaw and neck to be at their most relaxed position. Once the orthotic is working Dr Dowker is able to treat the rest of the body and allow you to start healing yourself. What type of jaw issues do you treat? At TMJ Centre Melbourne we will treat any kind of jaw issues including, pain, jaw locking, and if appropriate jaw noises. We also treat overstretched ligaments with Prolo therapy. Muscle pain is treated with bite plates/ orthotics, chiropractic, trigger point, and laser therapy. Our goal is to help you get your life back without the use of drugs. Many studies have shown considerable improvement or complete elimination of headaches at the back of the head (occipital) and temple headaches when TMJ/TMD is properly treated. 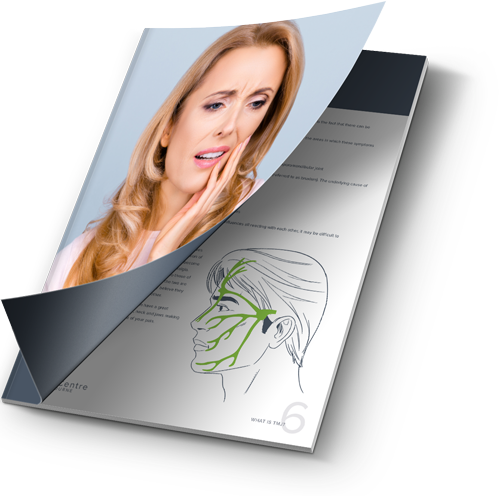 Leaders in the field of TMD recognise that up to 85% of headaches are due to muscular issues. TMJ disorder involves complex relationships between teeth, muscles, jaw joints, cranium, neck, brain, balance, postural stability and the nervous system. Therefore when something goes wrong it can have far reaching consequences beyond jaw pain, such as dizziness, tinnitus, ear pain/stuffiness, lower back pain, irritable bowels, difficulty sleeping and eventually fatigue and depression. At TMJ Centre Melbourne, through our Holistic combined approach of Dr Shah and Dr Dowker we have helped hundreds get their life back. What happens during the TMJ treatment process? Depending on your diagnosis you may need a combination of bite plates, laser, trigger point, cranial, and chiropractic care. For those with more severe/ long term symptoms we usually see individuals every two weeks for about 3 months, which how long it takes to heal most joints in the body. Does TMJ treatment require surgery? Research shows that up to 95% of those suffering from TMJ/TMD should be and can be treated WITHOUT surgery. All authorities agree that surgery should be the last resort. How much is an initial assessment? The cost is $340 for an hour consultation with Dr Dowker (TMJ Chiropractor / Craniopath) and Dr Shah (TMJ Dentist). Is your treatment covered by Medicare or health insurance? Unfortunately, Medicare does not help cover TMJ/ Sleep apnoea treatment. If you have private health cover there are dental and chiropractic item numbers that can be used to help make a claim. Every health fund has different levels of cover so it is worthwhile checking with your health fund to see what is covered. TMJ refers to the temporomandibular joint which is the jaw joint on either side of the face. However, most people refer to TMJ as a diagnosis of the medical term known as Temporomandibular Joint Disorder, TMD. TMJ or TMD is an umbrella term for a complex myriad of symptoms that occur when the jaw joints and associated muscles are disrupted. It is very common and can lead to symptoms such as headaches, face pain, jaw pain, neck ache, back ache, ear pain, tinnitus and much more. If I have lived with TMJ headaches for years, can I leave it untreated? TMJ headaches will rarely go away on their own and you will risk living with pain and discomfort for the rest of your life, should you leave it untreated. As your system tries to accommodate the problems associated with the disorder, it may actually become worse. In many cases, if left untreated, TMJ headaches will continue to progress, causing more and more pain and discomfort. Yes. However, many people go undiagnosed or are misdiagnosed with tension type headaches, sinus headache and even migraine. Often people can have both TMJ syndrome and headaches and when they have TMJ Syndrome treated the headaches usually reduce in frequency and intensity, often disappearing altogether. Could my TMJ headache be a result of my diet choices? TMJ headaches come as a result of an injury to the TMJ joint and surrounding muscles. This injury could be caused by biting on or chewing something hard and your headache symptoms could be aggravated by consuming difficult to chew foods. Sleep apnoea happens when your breathing stops for prolonged periods during sleep. When left untreated, sleep apnoea can affect your daily activities, cause fatigue, a lack of focus during the day, and sometimes even high blood pressure, depression, and, up to 5x increased chance of strokes and heart disease. How do I know if I suffer with sleep apnoea? Loud, frequent snoring. The pattern of snoring is associated with episodes of silence that may last from 10 seconds to as long as a minute or more. The end of an apnoea episode is often associated with loud snores, gasps, moans, and mumblings. Not everyone who snores has apnoea, by any means, and not everyone with sleep apnoea necessarily snores (though most do). This is probably the best and most obvious indicator. Excessive daytime sleepiness/fatigue. Falling asleep when you don’t intend to. Body movements often accompany the awakenings at the end of each apnoea episode. Getting a good night’s sleep is vital to our health. It’s just as important as a nutritious diet and daily exercise. Without enough sleep our bodies won’t function to their maximum potential. With a lack of sleep, we may even start to develop serious health problems and affect our work and relationships. Just because you snore, does not necessarily mean that you have sleep apnoea. However, snoring can often be a sign of a more serious sleeping disorder in sleep apnoea. Snoring is essentially the partial obstruction of your upper airway, but when there is also a cessation of breath or ‘apnoea’, it becomes a more serious condition. Even regular snoring can be incredibly disturbing to your sleep and can usually be treated with simple over the counter products. If you think that you are suffering from sleep apnoea, we urge you to get in touch. Sleep apnoea affects a significant amount of the population whether they know about it or not and the first way to treat its symptoms is by recognising them and making an appointment to see a specialist before it worsens. Should we determine that you are a sleep apnoea sufferer, we can then consider you for CPAP or Continuous Positive Airway Pressure. CPAP eliminates snoring and the pauses in breathing that characterise obstructive sleep apnoea. In some cases, CPAP may be used in conjunction with other treatments in order the achieve the best results possible. Sleep apnoea can become extremely detrimental to your health if you don’t seek out treatment as soon as you become aware of it. Sleep apnoea patients experience oxygen deprivation during the night that prevents you from achieving the quality of sleep required to properly recover your body’s major systems. Sleep apnoea can lead to sleep-related road accidents as well as other risks that include heart disease, stroke and high blood pressure. Should sleep apnoea be allowed to start to affect aspects of your health, it is vital to receive treatment from an experienced practitioner. There have been a number of studies indicating that specialist TMJ treatments are able to completely eliminate and significantly soothe headaches at both the back of your head as well as your temples. It is commonly accepted wisdom within the TMJ community that around 85% of headaches are caused by muscular concerns. TMJ and its associated disorder affects the complex relationships between your teeth, jaw joints, neck, cranium, brain, central nervous system and your muscles. This interconnectedness means that any problems you may have are able to be felt all over your body and that is why we centre our treatment on a holistic approach. Do popping jaw joints meant that I have TMJ disorder? A fairly common question that a lot of TMJ sufferers tend to ask, is whether popping jaw joints are a direct result of TMJ. While popping jaw joints is a symptom of TMJ, it does not necessarily mean that you are suffering from TMJ. There are a lot of patients who experience this popping in the jaw who don’t suffer from TMJ. The only way to really tell if your popping jaws are a direct result of TMJ, is to come in for a consultation so that we can properly diagnose you and get to the root of the issue. If the popping is accompanied by headaches or jaw pain, then it is likely that you may suffer from TMJ. Can denture wearers develop TMJ? Denture wearers can absolutely develop TMJ and they actually have a reputation for causing frequent pain in the jaw and temporomandibular region. If your dentures are ill-fitting or even slightly loose, they can have a massive effect on your jaws because you will unconsciously begin to try and shift them into a more aligned position. This puts a constant stream of unnecessary strain on your TMJ and this is then felt as pain in your jaw. If you wear dentures it may also take you longer to chew your food which places even further stress on your TMJ. The acronym for temporomandibular joints is TMJ, the acronym for the disorder of these joints is TMJD with the ‘D’ referring to this disorder. TMJD can be a source of massive pain and discomfort for those who suffer with it and affects the TMJ, which is located just in front of the ear where your jawbone is connected. TMJD can often be mistaken for other conditions such as pain in your ears, arthritis or sinus problems. It is most commonly caused by an uneven bite or malocclusion, where your jaw is out of alignment. This leads to constant stress on your muscles, nerves and connective tissues in your jaw. Though there are a number of symptoms for TMJD and its causes can be difficult to determine, there are some more common indicators. Should you experience soreness of your jaws and teeth, and/or frequent migraines or severe headaches, then you could very well be suffering from TMJD. Additionally, you should also seek treatment if your ears ring occasionally, you feel a clicking or popping in your jaw, experience back and neck pain or a tingling sensation in your arms and hands.